We are very excited to announce the next-generation Brightcove Video Cloud Smart Player, which provides a new level of stability and consistency for HTML5 video experiences on iOS and Android devices. Other online video player enhancments include support for the VAST 2.0 advertising standard and turnkey integration with Google DoubleClick ad serving solutions for HTML5 video. In a new whitepaper released today on HTML5 video tag behavior, we describe a number of common video player problems encountered in the industry based on operating system version and browser compatibility on popular smartphones and tablets. These issues can prevent smooth video playback and block reliable ad delivery and analytics, resulting in poor user experiences and ineffective content monetization. How big is this problem? Turns out that the fragmentation of operating system versions running on devices accessing HTML5 video experiences is splintering rapidly. 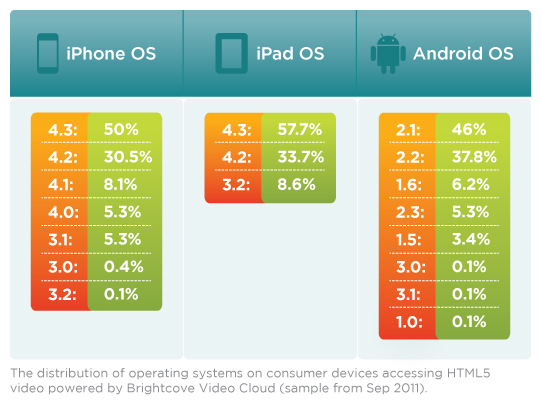 In the whitepaper, we provide a snapshot of operating systems on consumer devices accessing HTML5 video powered by the Brightcove Video Cloud online video platform. As you can see, there are nearly 20 different versions of iOS and Android on these devices. The rapid pace of innovation among device manufacturers and increasing fragmentation of operating systems has raised the bar for online video platforms offering cross-platform video players. Brightcove has developed a new framework for using the HTML5 video tag that not only helps ensures consistency, but also allows Brightcove to rapidly deploy new player innovations that work regardless of operating system version and without the risk of breaking backwards compatibility with older versions. "Google believes in the growing importance and evolution of HTML5 to enable distribution across multiple devices and browsers. We're particularly excited to partner with Brightcove to offer an integrated and efficient HTML5 video monetization experience for publishers. This is one of the many areas where Google is investing to help publishers deliver more engaging advertising experiences and increase the value of their video content." To learn more, download the new whitepaper, "HTML5 Video Tag: What you need to know about HTML5 video tag behavior and compatibility." Brightcove will also be hosting a webinar on HTML5 Video and the new Video Cloud Smart Player on Wednesday, November 2nd at 1:00 PM EDT. Register for the free webinar today.